If we are what we eat, most of us are fast, cheap, and easy. Let's change that! This past week we’ve enjoyed watching the live internet stream of the eagles nest at the Decorah Trout Hatchery. The eaglets hatched and the parents had a rabbit along with a collection of small birds to feed them. 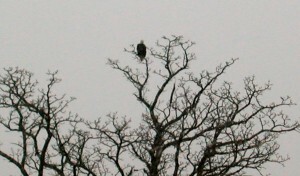 Here in north east Iowa bald eagles are prevalent. 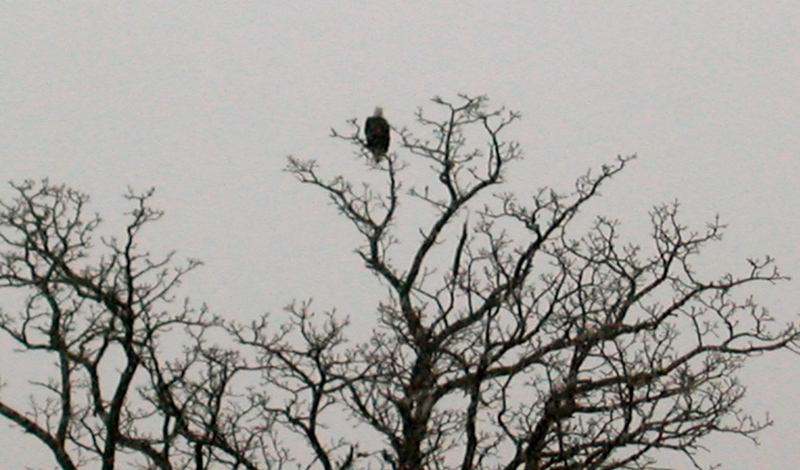 All winter there are a pair of eagles at our farm. In the spring they relocate to their nest along the Turkey River. They hunt in our area throughout the year. As a result, we’ve had to alter our plans during the hatching and farrowing season. 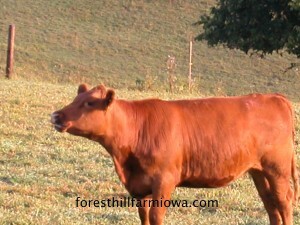 Our sows use to farrow in the pasture. Between the owls hunting at night, the eagles by day, we were loosing piglets. Farrowing later in the spring is safer for the piglets. The bald eagles don’t travel far when their eaglets are very young, instead they hunt closer to their nesting areas. After ten days the shoats (piglets are called shoats) are too large for predatory birds to carry off. We have great respect for the bald eagles. It’s both fascinating and thrilling to see them up close. A couple of years ago Keith and Cookie were fortunate observers of a ceremony to release a bald eagle back into the wild. The eagle had been caught in a net, injured, and rehabilitated. 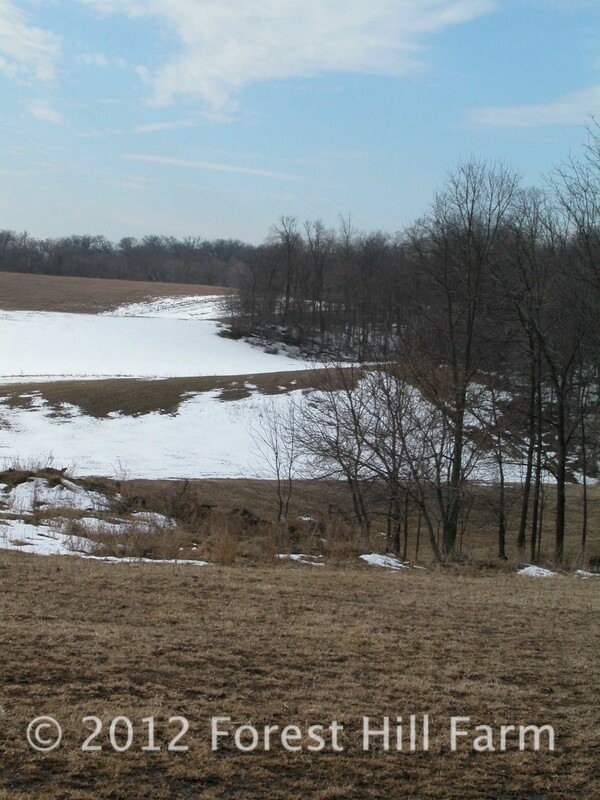 This event was in Blue Mound, Wisconsin, along the banks of the Wisconsin River. There was a crowd of spectators (mostly boy scouts), a DNR agent. Two Native Americans (father and son) were performing a ceremony to release the eagle back into the wild. The son explained that his father would be speaking to the Great Spirit and the spirit of the eagle. His song would unite the soul of the bird with the Great Spirit. As the Native American elder began singing the crowd became silent. The eagle, which had been agitated and restless, stopped his movements and focused intensely on the singer. As the song progressed the bird never diverted his gaze. The DNR agent removed the leather straps that tethered the eagle to her arm. Now, completely free, the bird remained still and focused. After several minutes the song ended. Remaining still for a moment longer, the eagle shifted his gaze, then lifted into the sky. He flew across the river, and alighted into a tree branch on the river’s edge. For a brief moment in time Keith and Cookie were privileged witnesses to a melding of two spirits. Our family has a story to pass along; the story of a regal Native American who joined the spirit of heaven and earth and through his song became the conduit for both. The way that Native Americans were treated is a shameful chapter in American history. During the plains wars the soldiers justified their actions claiming the Indians were “heathens”. This couldn’t have been further from the truth. For years the polluting of our fields and waterways were abusive to wildlife. Thankfully the use of some of those pollutants has been eradicated. Sadly, we may discover too late the harmful effects and the full spectrum of disorder that today’s defoliants/herbicides has caused. The proponents of factory farming insist that organic practices aren’t practical for feeding the world. If one's actions require justification perhaps one isn’t acting “justifiably”. "Hey, They taste like chicken!" The boys and I headed to Florida at the end of February, Keith held down the fort. Our vacation was too short, as all vacations are. We visited with my parents, aunts, uncles, and cousins. We ate, enjoyed the sunshine, played on the beach, ate more, swam, laughed, played tourist, ate even more, and finished our vacation at Universal Studios. Because we were driving (I love driving trips), we had to watch the weather very carefully. Keith, my dad, and the Weather Channel kept us posted on an ice storm consuming the midwest. On our way through Georgia we stopped at a rest area to view the live weather radar. Standing in front of the screen was a very tan gentleman. He was shaking his head, despondent. “Headed back north?” I asked. “Look at all the pink and white on this weather map! It’s sad, isn’t it?” I commented. “On the bright side, spring is just around the corner.” I tried to sound enthusiastic, I really wanted to head back south. I shook my head from side to side. As we got to the door I turned and said, “Your going back home to be with family and friends. I started running and then I called out, “You know, misery loves company!” For all I know he’s still staring at that map, waiting for all traces of white to disappear. Someone, PLEASE Shoot the Messenger! Author glendaPublished on August 9, 2010 April 2, 2012 Leave a comment on Someone, PLEASE Shoot the Messenger! Successful Farming Magazine’s May-June issue, had an article titled “Midlife Weight Gain Cuts Life Span.” Considering the information presented in the article, I have less than six minutes to live. Beginning in1976 researchers studied 122,000 women between the ages of 30 and 55. The research reveals that women who lived to at least age 70, without major chronic disease or serious health problems, did not gain weight between ages 30 and 55. For each 2.2 pounds of weight gained, the chance of healthy survival decreased by 5%. Other studies show that the location of excess weight makes a difference. A waist circumference exceeding 28 inches indicates excess fat around major body organs. This is linked to heart disease, high blood pressure, cancer, and diabetes. In a study that I will be conducting, researchers, who report on women with waist circumferences greater than 28 inches, will have greatly impaired health due to tar and feathers that clog their pores. Published on August 9, 2010 April 2, 2012 Categories In the NewsLeave a comment on Someone, PLEASE Shoot the Messenger! Monsanto Co. spent $2.46 million in the first quarter of 2010 to lobby the federal government on a proposed change to agricultural issues that could affect the worlds largest seed company, according to a disclosure report. Monsanto’s lobbying expenditures are up from the $1.28 million they spent in the same period last year. At issue are seed patent laws that the Department of Justice is investigating to see whether antitrust laws were violated. The corn seed is treated with the fungicide Maxim XL, and the tomato seeds are treated with thiram. Thiram belongs to a class of highly toxic chemicals called, ethylene bisdithiocarbamates (EBDCs). The EPA determined that EBDC treated plants are so dangerous to agricultural workers that they must wear special protective clothing when handling them. Toby Grimes* was legendary as the dumbest kid to ever walk the halls of Ogden Avenue Elementary School. Older students would bait him into situations highlighting his lack of common sense. Toby was the older students' favorite muse. He never seemed to mind being pointed out as an idiot. He would smile and nod as the older boys would offer him a choice of either fifty cents in coins or a dollar bill. Toby appeared to weigh his options carefully, but in the end, he always chose the coins. “Two coins is better than one bill, I’ll take the coins!” He’d announce. The older boys would always roar with laughter and point out Toby’s mental short-comings. Laughing they'd handed him the change. The other boy who stands out in my memory, Harold Tinkler* was the most enterprising boy in our junior and senior high school, although I didn’t realize it at the time. 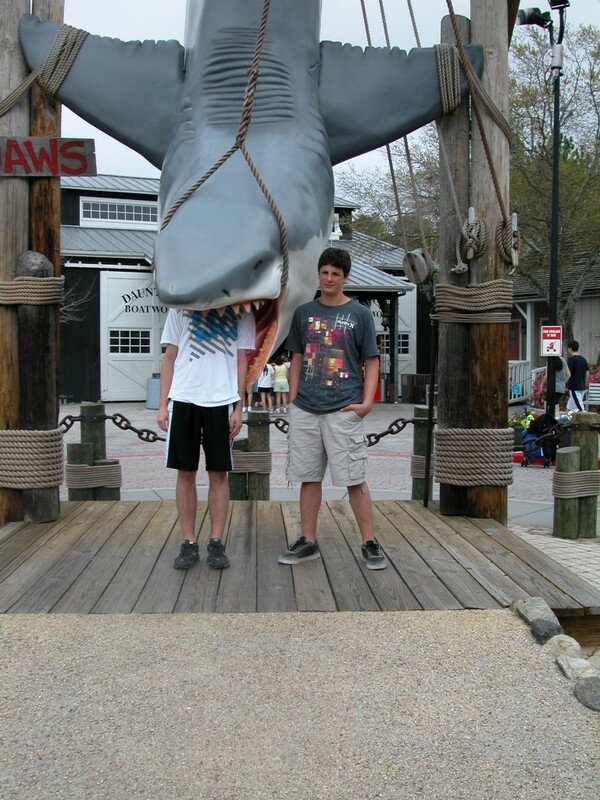 He had nerdiness down pat. Pocket protector, slide rule, thick glasses; he was the epitome of a nerd. He worked hard in school, always earned top honors, and was born to succeed. He lacked social graces; most of the girls thought he was creepy. Despite his social failings he was an entrepreneurial success. This year our greatest asset is grass, lots and lots of grass. 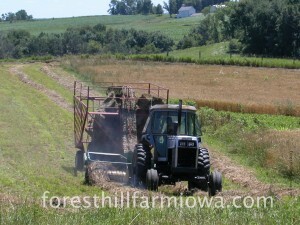 We’re thankful for a plentiful hay crop, we’ll continuing to dodge the rain and make hay when we can. We’ll capitalize on the benefits of a successful growing season and store extra hay for dryer days ahead. Enjoy the sunshine and the rain! It's April First, Again. 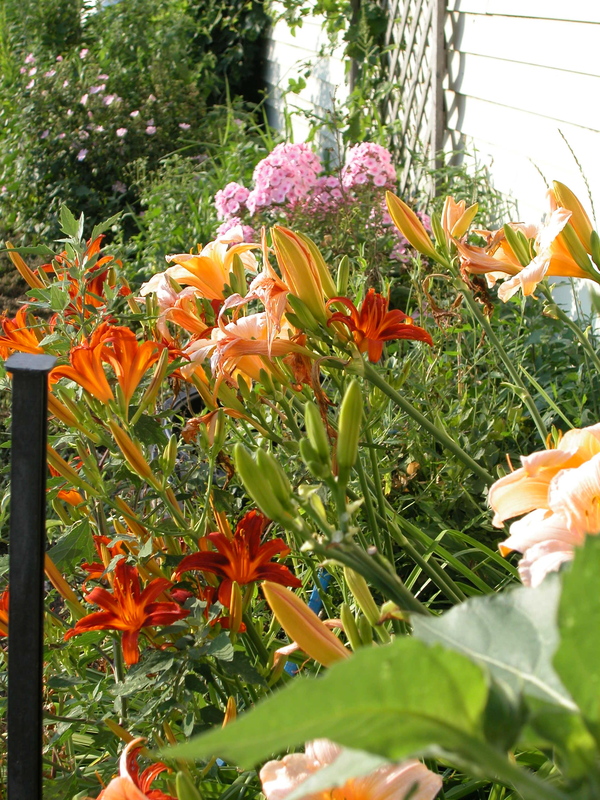 A few years ago we had experienced a very mild winter and exceptionally early spring. Around St. Patrick’s Day we tilled and planted our garden with cool season seeds. I should probably qualify this story and explain that Keith had never been involved in the early stages of garden preparation and planting but embraced the task with enthusiasm. The variety of peas we selected boasted claims of, “fast germination, earliest to produce, and large yield”. Every afternoon, when he would get home from work, Keith would run down to the garden to look for new growth and see if any seedlings had sprouted. Watching his exuberance inspired an idea for an April Fools trick. My dad loves Keith and loves playing tricks on him. He helped me paint bunches of plastic plants in bright green; we had a variety of leaves and plastic stems of all shapes and sizes. We planted our painted beauties in the same rows as our seedlings and laughed all the while thinking of Keith’s reaction. As usual, Keith visited the garden when he got home. Watching him from the window we saw him turn toward the house. Keith was clapping his hands and running. Flinging open the door, he cried, “Holy Cow (or something to that effect)! You won’t believe how much everything has grown.” We followed him back outside, pinching ourselves to keep from laughing, We were grinning from ear to ear as we watched his reaction. Bending forward Keith rubbed a leaf, shook his head and began to laugh. There’s great joy in a good natured joke that plays out well. Over the past twenty-one plus years I’ve played several April Fools jokes on Keith, he’s always a good sport. This weekend as I plant the garden I’ll be snickering to myself as I recall that April Fools prank. My parents will be home from Florida within the next few days and when they come to visit I’ll show them this year’s garden and we’ll all laugh as we remember our painted garden. I have previously written about how we are all surrounded by the most gracious, caring and compassionate neighbors. 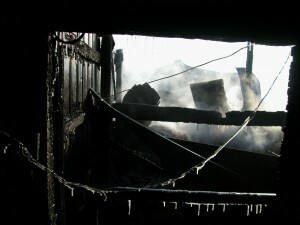 That fact was so evident on Saturday night when we experienced a barn fire at our farm. We lost a building, some equipment, our sows and their babies. But we gained an overwhelming respect for the compassion offered by our community. That compassion has left our family awestruck at how truly fortunate we are. My wise and wonderful grandmother, Marion Fisher used to say; if something can be replaced with money it isn’t that important. We have always tried to view our glass as half full, we’re optimists, but after the concern that you’ve all shown to us we know that our cups aren’t half full, they’re overflowing! We so humbly thank all of you for your kind words and encouragement; they’ve meant the world to us. Four fire departments responded to our call for help and I can’t begin to express how grateful we are for the action and organization of these community heroes. They contained the fire to two buildings and prevented it from spreading to the next. We interrupted the Elkader Fire Departments Christmas party (which was delayed due to battling a fire on the previously scheduled date), and others from enjoying the movie in town. These volunteers put the needs of their community and neighbors above their own. There are countless places that they could have been but they put our needs first, how commendable. You don’t raise heroes, you raise sons. And if you treat them like sons, they’ll turn out to be heroes, even if it’s just in your own eyes. – Walter Schirra, Sr. I try not to waste my prayers on earthly desires; material wants or a fatter bank account. I’ll reserve my prayers for humanity and heavenly intervention for those in need. I’ve prayed for three things in my life 1) someone to love 2) someone to love me back 3) the health of our family, friends and neighbors. Those three prayers have been answered and so I have nothing to complain about in life. I try not to let unkind words or gossip escape from my mouth. If I remove them from my heart they usually don’t get caught in my throat. The more often I clean my heart the easier I find the joy in loving my neighbors. All of you must subscribe to this same philosophy because we have experienced countless examples of love here in northeast Iowa. Our sows were just starting to farrow on Saturday. The first piglet born we named Glenda because she and I shared the same birthday and she was whining about the cold, just like me. We truly love all of our animals; they are such a huge part of our lives. I hope that there is a hog heaven, and if there is, I hope that Dolly, Molly, Lizzy and all of their babies are cared for by someone who will love them as much as we did. I hope their care givers know how much they love having their backs scratched with the rake and that when they get tucked in at night an Oreo cookie helps them have sweeter dreams. So, sweet dreams girls. I hope hog heaven is lush and full of sunshine and Oreos. Our family thanks you for all of your kindness. Celebrate this April Fool’s Day!